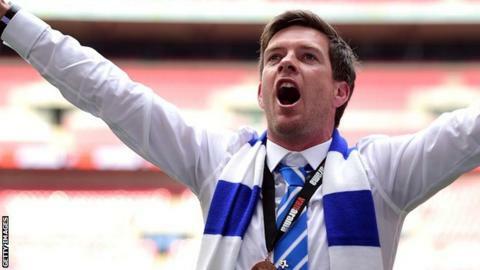 Manager Darrell Clarke says guiding Bristol Rovers to promotion from the Conference "felt like a massive weight lifted off my shoulders". The Pirates beat Grimsby Town at Wembley on Sunday to seal an instant return to the Football League. "I took over for the last eight games of last season and we got relegated," the 37-year-old told BBC Points West. "But to bounce back in the first year, and to see the smiles on the fans' faces, it's a tremendous feeling." Rovers, relegated from the fourth tier for the first time in 94 years only 12 months ago, secured a dramatic penalty shootout win over the Mariners to become the first side to bounce straight back up from the Conference since 2005. Clarke took charge at the Memorial Stadium last March with Rovers 20th in League Two, three points above the relegation places. Victory in his first match as manager extended that gap to six points - but the Pirates fell away badly in the closing stages, before defeat by Mansfield Town on the final day of the campaign confirmed their relegation. Rovers have recovered well this season, however, only being pipped to the Conference title by a single point, and then regrouping to first overcome Forest Green and then Grimsby to go up via the play-offs. "It's the best feeling," said Clarke. "It was the first time I'd led a team out at Wembley and to win it on a penalty shootout in front of tremendous support was something I'll always remember. "We weren't at our best. The game could've been gone after 20 minutes. [Goalkeeper] Will Puddy was fortunate to stay on the pitch for his handball. "It could have all gone wrong, it really could. I'm not going to stand here and lie. The football gods were shining on us today. "But we finished second in the league, we were a point off getting automatic promotion and, if you look at the table, overall I think we deserve it." Success in the Conference promotion final means that Rovers, who were in the third tier as recently as the 2010-11 season, now have 82 days to prepare for life back in League Two. Chairman Nick Higgs, who had considered quitting the club following relegation last year, says that plans for next season have already been discussed - and that manager Clarke "knows where he wants to strengthen". Higgs said: "We're going to keep the momentum up and challenge. I think our budget will be very, very good for that league now. "We made decisions before the final, that if we got promoted we'd strengthen in certain areas, so we'll do that now and it all starts again on Tuesday."